Kid's Night In = Parent's Night Out! Every year for Halloween we help parent's get an evening out kid free while knowing their child is staying safe and active! 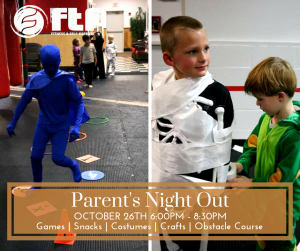 Games, obstacle courses, crafts, a self defense class and more are part of our Halloween Parent's Night Out!